Winner #1 is Paula W ~ my wonderful friend in Arizona (I miss you sweetie)!!! 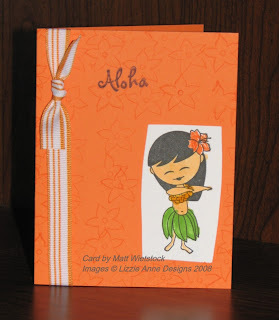 Paula you have won the new Luau set from Hanna Stamps! Winner #2 is Sallmi ~ Sally, you have won the Hanna Baseball set from the July release. You need to send me your email (kendra.wietstock@comcast.net). If I don't hear from you by 10pm on August 1st, I will have to pick another winner. BTW ~ Have some more candy up my sleeves; however, you need to comment to win. You never know when I'm going to pick a winner. I'd love to see your projects and your blogs & I'll visit as many and as much as I can ~ so leave me links! Last Day for Blog Candy! Sign up while you still can! You have until 10:00pm tonight (EDT). Feel free to post as many times as you'd like. Hmmm....today why don't you tell me your favorite stamp set as of right now (and which company makes it). So my favorite Hanna set for this week's release ... you'll have to tune in tomorrow because that's when I'll show it to you... I saved my best for last! 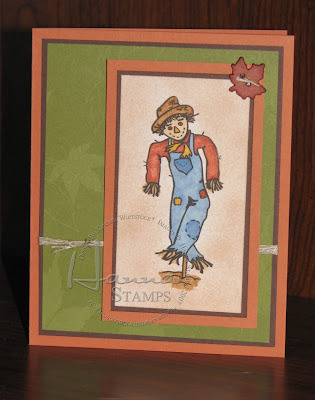 OK...on to the sneak peek for today ~ Yes, it's almost time to start stamping for Halloween! 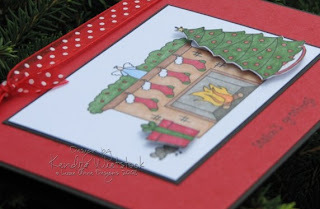 Which, by the way, is one of my favorite holiday's to stamp cards and projects. 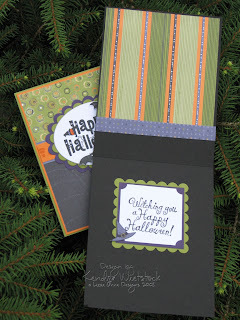 Supplies Used: Stamps ~ Hanna Stamps (Halloween); Cardstock ~ Stampin' Up! 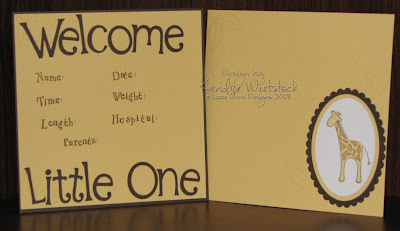 & Papertrey Ink; Ink ~ Palette & SU; Ribbon ~ SU; Nestibilities by Spellbinders; Misc brads and clips. Arrrrrrrrrrrrrrrrr...Talk like a pirate today! Hmmmm...can you guess what kind of card I'll be showing you today? LOL! Yes, you're right! 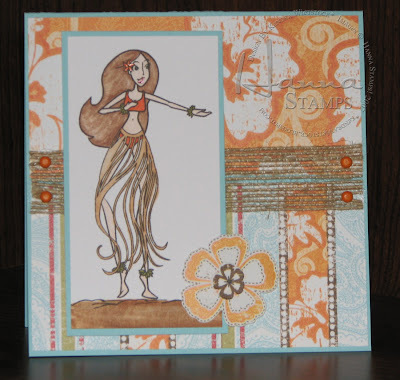 Hanna Stamps will a pirate set this Friday as part of the release. 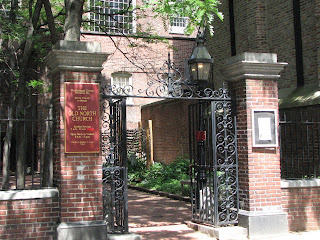 Now don't forget to post for the blog candy ~ tomorrow at 10:00pm (eastern time) will be the end of the candy this week. And, I'm drawing two winners. See my post from Monday, for all the details. 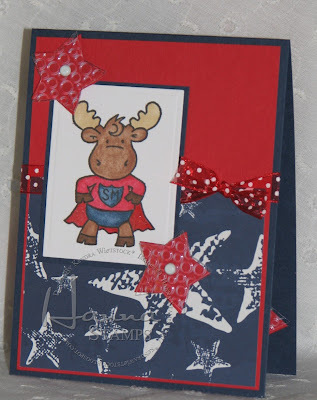 Supplies Used: Stamps ~ Hanna Stamps (Pirate set) & Hero Arts (alphabet); Cardstock ~ Stampin' Up! 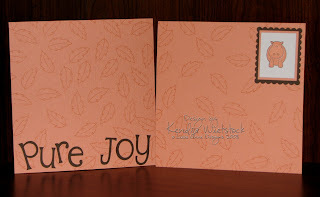 ; Ink ~ Palette & Papertrey Ink; Label punch ~ Stampin' Up! 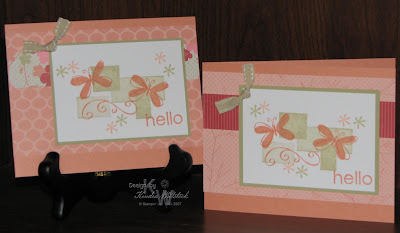 ; Embossing plate ~ Cuttlebug; Ribbon ~ Stampin' Up! ; Brads ~ Queen & Company. It's day #2 of my Hanna Peeks & don't forget to sign up for your chance to win some Hanna candy all this week. Feel free to post daily ~ just be creative with your post. Yesterday, many of you told me about projects you were working on & a few of you even gave me links to your blog or gallery. I would LOVE to see you projects so PLEASE, PLEASE, PLEASE leave me a link ~ I would really love to get to know you too. So my sneak peek for today is from the new Hanna set for Halloween. This new scarecrow is super cute and so easy to color with my fun Copic markers. Speaking of Copics, do you have any yet? My goodness, they are such a great tool. They blow any other marker out of the water! They take a little practice, but the results are well work the time and money. If you want to learn more about using Copic Markers, check out this cool blog by the Copic expert herself, Marianne Walker. On a separate note ~ I feel like I have a fresh and clean outlook today. I saw my Oncologist yesterday for my every 3-month checkup & I'm still Cancer free (2 1/2 years now). Those are such sweet words to hear! I never realize that I've been holding my breath for the week between bloodwork and the doctor visit. Just thought I'd share my wonderful news! 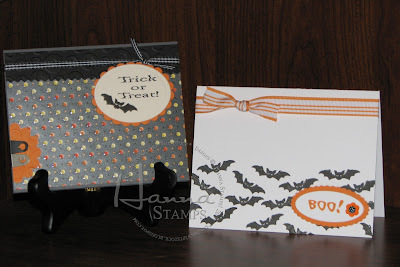 Supplies Used: Stamps ~ Hanna Stamps (Halloween); Cardstock ~ Stampin' Up! & Papertrey Ink; Pattern Paper ~ Reminisce; Ink ~ Palette & Copic Markers; Ribbon ~ Linen Thread; Button ~ Unknown. Let's celebrate the first day of sneak peeks for the new Hanna Stamps sets with some CANDY!!!! That's right ~ it's time for some BLOG CANDY!!! I have two adorable Hanna Stamps sets to give away ~ one from last month's release and one from this month. Which sets ... well that I'm keeping a surprise. So...what do you need to do? 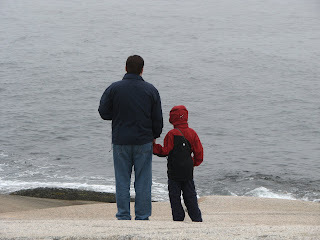 Well it's easy ~ just post a comment on my blog starting NOW until Thursday, July 31st at 10:00pm (EDT). You can post every day if you want, that's fine with me. Tell me about a new project you made, a new stamp you just bought, or maybe you liked my project that day ~ be creative! On Thursday evening, I will randomly draw TWO winners (one for each set). Make sure I can get in touch with you by leaving me an email, or I'll have to draw a new winner. BTW ~ you can put your comment on any of my blog posts. OK... since it's the start of sneak peek week, I guess I'd better show you a card! This cute little Hanna is from the new Luau set that will be available this Friday, August 1st. 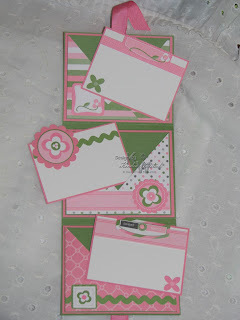 Supplies Used: Stamps ~ Hanna Stamps (Luow); Cardstock ~ Stampin' Up! ; Pattern Paper & sticker flowers ~ Art Warehouse; Ink ~ Palette & Copics; Burlap Trim ~ SEI; Brads ~ Making Memories. Yesterday I showed you my first three cards for my class & today I'll show you the remaining two. I decided that I wanted to use up as much of the pattern paper as possible, so I put a few different paper combinations on them. I think I'll probably hold on to all of these sets that I've posted today. I love the library card, the big flower and the entire set of Sweet Shapes. I will also really miss Wild Wasabi ~ love that color! That's the name of my class next week and I think it's kinda catchy. The girls will come make as many cards in 5 different designs as they want in 3 hours. Then they pay at the end of the evening for the number of cards they made. I pulled out a bunch of sets & accessories to play with that will be retired after this catalog. Here are the first 3 designs ~ more tomorrow. Just a quick little birthday card to show you today. 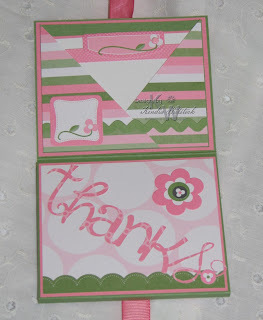 This is one of my favorite Lizzie Anne images ~ easy to stamp, easy to color and easy to slap on a card base! Don't ya just love that? I found this colored image a few weeks ago stuffed in a drawer. I had to put it on a card ~ it just felt wrong leaving it all alone! Isn't this idea AMAZING! 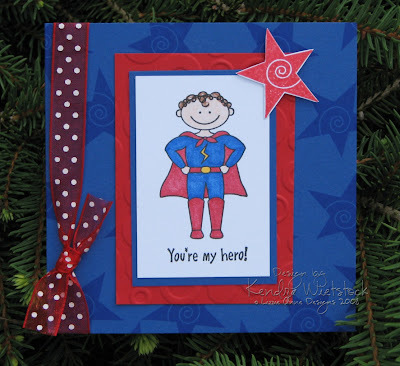 My sweet friend Michelle Yager found this great project on Jen delMuro's blog. Michelle & I got together and made these great little criss-cross wallet cards as thank you gifts to our CHA hosts. We tucked little notes inside the first two pockets and then an Archiver's Gift Card in the bottom one. I was so pleased how it turned out! We did end up changing the measurements a bit from Jen's template. The long piece measures 4 1/4" x 11" and is scored at 3 1/2" and 3 3/4" from each side. The three criss-cross pieces are 9 1/2" x 3 1/4" & are then scored at 2 3/4" from each side. 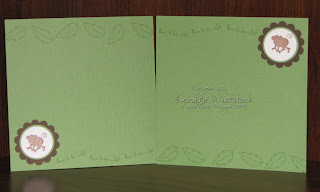 I then used one of the Stampin' Up! scrapbooking kits to decorate it. It was a fun and easy project. Please note ~ this project was designed by Jen delMuro and should only be used for personal use, not for personal gain. 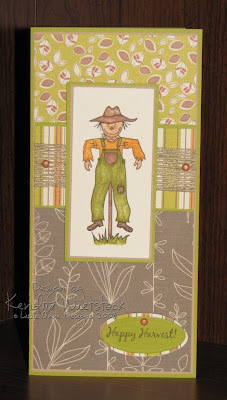 Well here I am again with another sample using the Happy Harvest set by Lizzie Anne Designs. This was part of my July assignment and I have to say ~ it was a wonderful assignment! 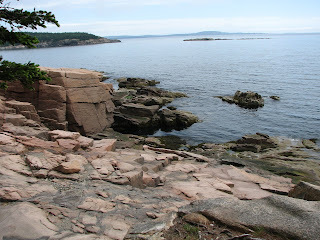 I also realized yesterday that I didn't share very many pictures of our cruise to New England and Canada, so I thought I would include a few in this post. Agh! Don't you feel like that some days? I know sometimes I wonder what happened to my brain. I have come to the conclusion that it's not that I'm getting old, it's just that I have too much to do. That's my line & I'm sticking to it!!! Anyway, I just LOVE this new scarecrow from the Happy Harvest set ~ he is probably my favorite image in this set (I say probably because I love them all). I arrived home on Sunday afternoon from CHA & I can't even begin to tell you what a blast I had. Seeing good friends, trying products and drooling over fun new things was just amazing. 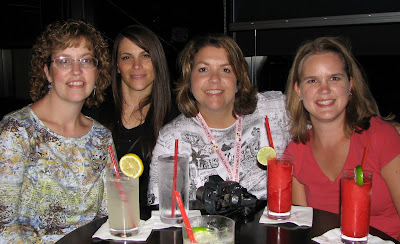 The picture above is of me with Lisa Johnson (Leese), Michelle Wooderson (Mish) and Heather Nichols (Pine). They are all so amazingly talented ~ I am honored to call them my friends! 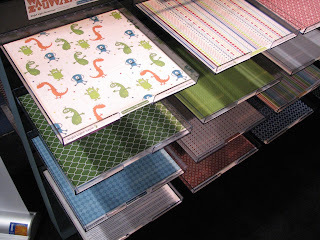 And yes, I do have a few pictures of some fun new products ~ This is the Itsy Bitsy Spider paper line by Piggy Tales ~ very cool double sided paper that has a larger pattern on one side which is perfect for scrapbooking and a smaller scaled down pattern on the other side for cardmakers. SMART!!!! 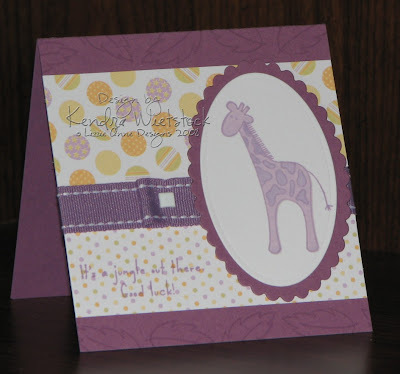 October Afternoon had a fun new paper line called Night Light. The monsters remind me of the movie Monster's Inc. It was very cute! 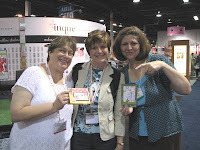 Oh and how could I forget Maria Gilbertson, Michelle Yager & Debbie Olson holding Lana's card samples at the Inque Boutique booth. Oh yes, that was another favorite! A bunch of friends gave me their free samples of these stamps, and I just ordered some, so you will see some cards with those posted very soon! It's not time to pick apples just yet, but you can bet that we will be getting some this year. 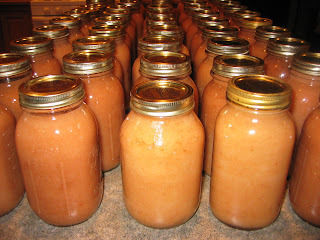 Each year my husband and I make homemade applesauce and it's so yummy that I can't even bring myself to buy store bought anymore. We also make a wonderful Apple Tomato Relish that is fantasic on pork. It's a recipe that has been in my family for years and years & thinking about it just makes my mouth water. 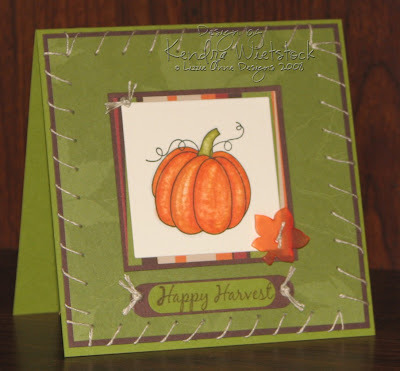 Supplies Used: Stamps ~ Lizzie Anne Designs (Happy Harvest); Cardstock ~ Stampin' Up! 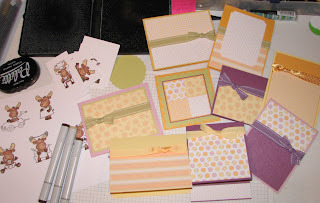 ; Ink ~ Palette & Copics; Hardware & Ribbon ~ Stampin' Up! ; Nestabilities. 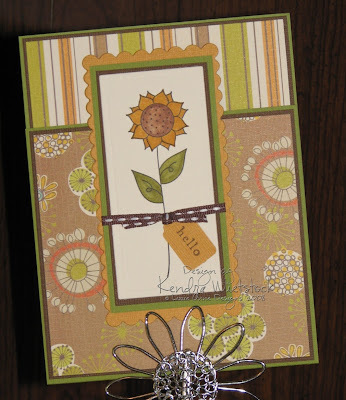 This card started out entirely different, but I was happy with the end result ~ that's what I love about cardmaking. I always say that mistakes are just an opportunity to embellish! I hope you're enjoying all the new Lizzie Anne sets that went on sale yesterday. I think you'll agree that Tricia and Meridith outdid themselves with this spectacular release. Thanks girls ~ you're the BEST! 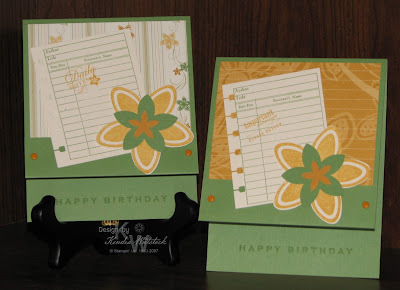 Supplies Used: Stamps ~ Lizzie Anne Designs (Happy Harvest); Cardstock ~ Stampin' Up! ; Ink ~ Palette & Copics; Linen Thread; Leaf Button ~ Doodlebug. Woohoo for Lizzie Anne Designs!!! I LOVE this new set called Happy Harvest. I'm not sure which of the new sets is my favorite, but this one is right up there near the top of the list. The images in this set are wonderful & there are so many. Over the next 5 days, you will see each of the images used in my cards. This card is actually open at the top; unfortunately, I forgot to take a picture of the opening. All of the new Lizzie Anne sets are now on sale over at the website ~ go take a look! 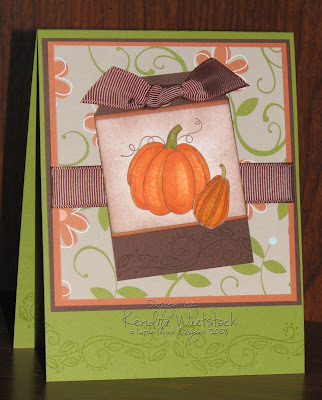 Supplies Used: Stamps ~ Lizzie Anne Designs (Happy Harvest); Cardstock ~ Stampin' Up! 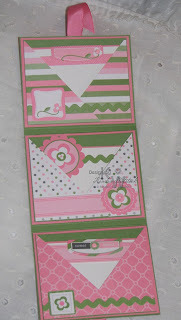 ; Pattern Paper ~ SEI; Ink ~ Palette & Copic Markers; Ribbon ~ Stampin' Up!. ... with more new sets ~ this one is called Rockin' Christmas. I don't do a lot of cards with scenes, but I had a ball making this one. I popped up the Christmas tree and the gift on it & I think it made a huge difference. It was totally fun. Have you used Copic markers yet? They make such a huge difference on my Lizzie Anne images or any other images you color in. The colors are so rich and full ~ and they blend beautifully. This weekend I'll be at CHA in Chicago and my friend Michelle Wooderson will be there. She has promised to give me a lesson with the Copics ~ I can't wait!!! Enjoy the rest of the sneak peeks today ~ there are some wonderful sets coming out tomorrow! Don't forget to stop by the Lizzie Anne forums tonight from 5 to 7 pm (PST) for the big Anniversary party. 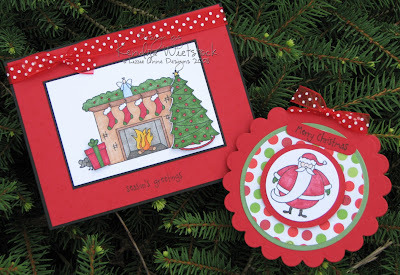 Supplies Used: Stamps ~ Lizzie Anne Designs (Rockin' Christmas); Cardstock ~ Stampin' Up! & Papertrey Ink; Ink ~ Palette & Copics; Ribbon ~ May Arts. Card #2: Nestabilities & Word Window Punch (SU). Lizzie Anne ... Saves the day! Introducing one of the images form the new Little People set by Lizzie Anne Designs. This super hero is also being released as a single. This is Sneak Peek day #3 & there are more wonderful sets to show you. I didn't order the other 2 sets being featured today (I know ~ what was I thinking?) ~ so go check out Lizzie & Meridith's blogs for the scoop on everything being shown today. I'm so excited! Today I'm going to Chicago to attend CHA (Craft & Hobby Association trade show). I'm meeting a whole bunch of friends and we'll walk the many aisles of new scrapbooking and stamping products coming out over the next several months. Woohooo! What a great weekend it's going to be ~ I'll check in with you next week with some pictures of all the fun new stuff coming out. 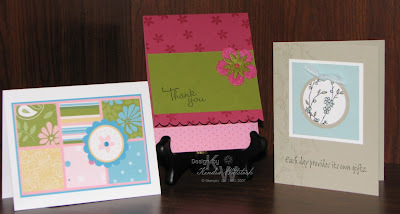 Supplies Used: Stamps ~ Lizzie Anne Designs (Little People & Holiday Cheer ~ Star); Cardstock ~ Stampin' Up! ; Ink ~ Palette, Copics, and SU; Ribbon ~ May Arts; Embossing Plate ~ Cuddlebug. 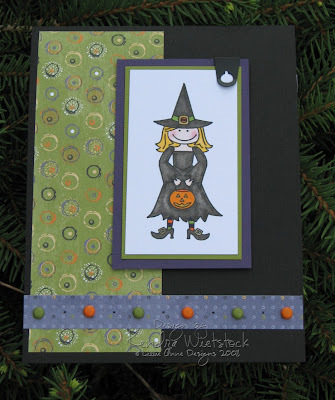 Here's day #2 of the Lizzie Anne Sneak Peeks ~ don't you just love the Halloween sentiments and the witch?!? The "Happy Halloween" and the "Witching You a Happy Halloween" are both single stamps. The new little witch is both a single stamps and is also part of a new set called "Little People" (which you will see more of tomorrow). There is one other set being shown today called Happy Harvest, but I'm saving all my cards for next week because it's my July assignment. Once again, hop around all the design team blogs for more fun peeks! 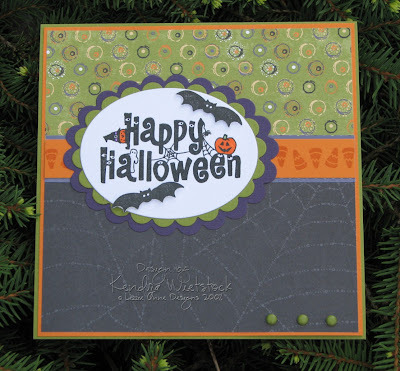 Card #1: Stamps ~ Lizzie Anne Designs (Happy Halloween single & Spooked stamp set); Cardstock & Pattern Paper ~ Stampin' Up! ; Ink ~ Palette & Copics; Nestabilities; brads ~ Making Memories. Card #2: Stamps ~ Lizzie Anne Designs (Little People set/single & Witching You... single); Cardstock & Pattern Paper ~ Stampin' Up! ; Ink ~ Palette & Copics; Nestabilities; Brads ~ Making Memories. YeeHaw!!!! It's finally time to show you some of the cool new stamps that Lizzie Anne Designs will release on Saturday, July 19th! 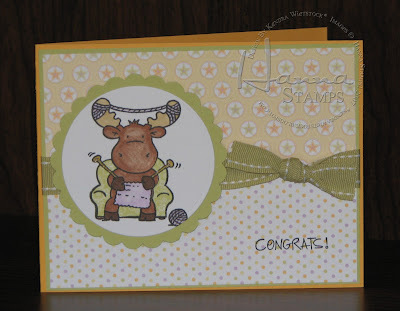 I am so thrilled with this release of stamps ~ Tricia and Meridith totally out-did themselves on this one! The card above is from the set called Giddyup Girl ~ this sweet little thing has several supporting images and is the perfect match to the Cowboy single that was released last year. The next set is called Garden Isle. 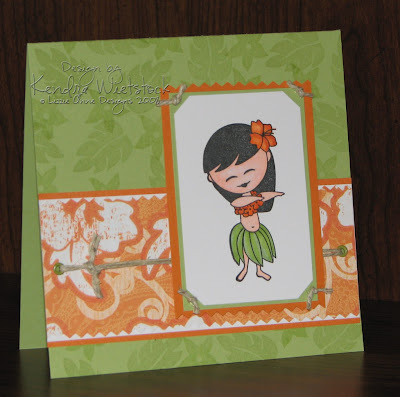 I just love the look of this sweet little hula girl! I was playing with my set the other day, and my son wanted to try his hand at making card ----> this is that he came up with. He was so excited when I told him I would put it on my blog. He may think he's been published now ~ LOL! 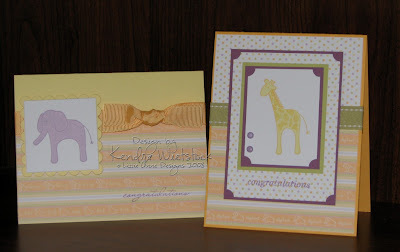 Hop around to the other designers blogs for more sneak peeks of these sets and a few new single stamps. You can find a list of the sites on Tricia's blog & Meridith's blog. 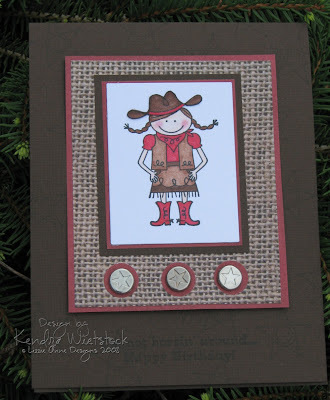 Card #1: Stamps ~ Giddyup Girl (LAD); Cardstock ~ Bazzill; Pattern Paper ~ The Paper Company; Ink ~ Palette & Copics; Brads ~ SU. Card #2 & 3: Stamps ~ Garden Isle (LAD); Cardstock ~ SU; Pattern Paper ~ Creative Imaginations; Ink ~ Palette, Copics & Versamark; Hemp & Ribbon ~ SU; Eyelets ~ SU. 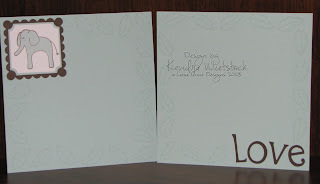 Oh & here's one more little peek ~ it's a sweet little "Handstamped by" single. This is the back of my little box. You'll have to wait to see the rest of the project. I am officially SICK of baby cards. I think I'm done with them for awhile. The funny part is, I don't even know anyone who is pregnant or adoption. 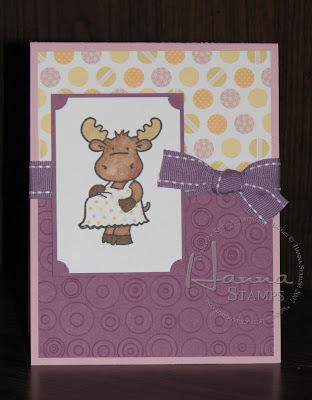 Anyway, I am really excited to post this super fun challenge that was posted over on the SCS Hanna Stamps forum board last Friday. The challenge was to use Acetate on a card. I've been wanting to try using acetate in my Cuddlebug, so when this challenge came out ~ I knew I was going to make my own clear embossed embellishments. Woohooo ~ I think they turned out super cool! 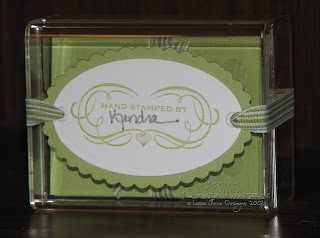 Get this ~ I used the clear plastic piece that came with my Papertrey Ink stamps. I tried using transparency sheets, but they were a bit too thin & my embossed image didn't really show up. I did emboss the full piece of acetate first & then cut them out with my star dies; however, I think it would work both ways. 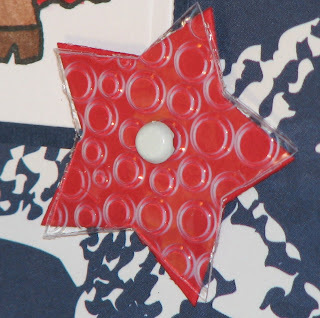 After I cut out the acetate, I cut the same stars out of cardstock and then attached them with a brad so the embossing would show up nicely. 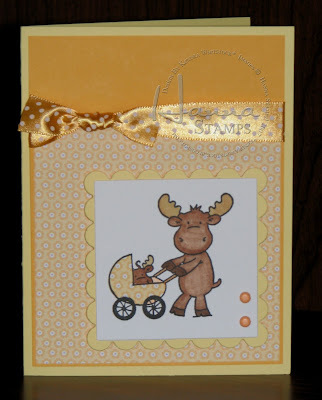 Supplies Used: Stamps ~ Hanna Stamps (Riley Collection); Cardstock ~ Stampin' Up! ; Pattern Paper ~ Unknown (super old from my stash); Ink ~ Palette & Copics; clear acetate; Embossing plate and star dies ~ Cuddlebug; Ribbon ~ May Arts; Brads ~ Making Memories. Congrats to you Jules ~ I'm sending you an email right now. Just email me your full name and address and I'll forward that information to the girls at Lizzie Anne Designs. You should receive your prize very soon. Thank you so much everyone for playing ~ I loved hearing what you all wanted to see. Some of you will be very excited because several of the suggestions will be in the release this week! If you didn't win today ~ you still have a few more changes. Check out Rose Ann's blog today & Lauren and Tricia tomorrow. Oh, and you have until July 17th to post your Birthday sketch cards in the Lizzie Anne gallery. WAIT ~ Don't leave yet... I have some cards to share today! 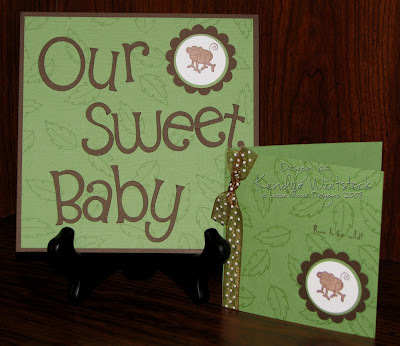 I thought I would share the last four baby cards I made last weekend during my mass production experiment. 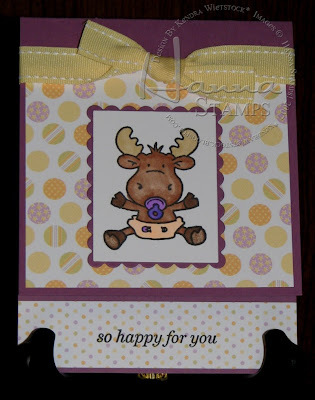 Although I love how they all turned out, I am tired of baby cards. Supplies Used: Stamps ~ Lizzie Anne Designs (In the Wild) & sentiment sets; Paper, Ink & Ribbon ~ Papertrey Ink; Nestabilities by Spellbinders; Brads ~ Making Memories; Marker ~ Copic. It's Blog Candy Time!!!!! Yes, Lizzie Anne Designs is turning 2 years old and they've been having a party all week long. Today it's my turn to have a little fun ~ Woohooo! Your prize ~ a surpise gift from Lizzie Anne! Are you new to Lizzie Anne Designs? Well this is the perfect time to get to know this fabulous stamp company! It's so easy... Just leave a message on this post telling me what type of stamp set you would LOVE to see Meridith and Tricia make for Lizzie Anne Designs. They are such talented girls, but I'm sure they would love to hear your ideas. (I think Kirsten asked a similar question earlier this week for her blog candy, but it might be new to some of you OR maybe you thought of another idea since then). When you leave me a message, be sure I can get hold of you! Leave me an email address. If I can't contact you, I'll have to pick another winner. You have until midnight tonight (June 12th ~ ET) to enter. I'll choose a winner randomly and post it on Sunday. Birthday Sketch Challenge ~ Don't Forget!!! So do you have some LAD stamps just begging to be inked up? Then it's a MUST that you enter the Birthday Sketch Challenge Contest ! You have until July 17th to enter your cards & there are 3 sketches to choose from. The prize is AMAZING ~ it's the entire Summer Release ($190 value). Here's my card with Sketch #2 using the In the Wild stamp set! The party isn't stopping today either ~ there will be more Blog Candy, sneak peeks of all the new sets starting July 15th, a big Anniversary Party on the Forum on July 18th, AND the Summer Release will go on sale on July 19th! You can check out all the fun details on the Anniversary Page. Supplies Used: Stamps ~ Lizzie Anne Designs (In the Wild); Paper, Ink & Ribbon ~ Papertrey Ink; Nestabilities by Spellbinders; Brad ~ Queen & Co; Marker ~ Copic. Guess what? I'm a cover girl!!! Well I have a card on a cover of a magazine that is & I am absolutely THRILLED. I found out last week that one of the cards I submitted to Scrap & Stamp Arts will be on the cover of the September issue ... Woohooo! If you click on the link above, it's the polka-dot card, but it's kinda hard to see the details of the card! Icing on the cake ~ I also have 3 more cards inside the issue. So excited that I just had to share the news! 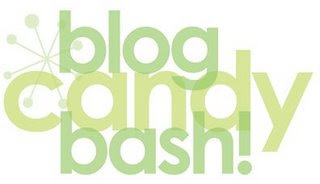 Don't forget to stop by tomorrow for BLOG CANDY! It's a Lizzie Anne Surprise!!!! Supplies Used: Stamps ~ Hanna Stamps (Riley Collection); Cardstock, Pattern Paper, Ribbon ~ Papertrey Ink; Ink ~ Palette & Copics; Nestabilities; brads ~ SU. Interesting combinations seem to happen when you just throw card bases together... that was the case here. The elements I ended up with are not something I would normally plan out, but I just went with the flow on it. Once again ~ there are still more prizes to win, so don't forget to check out the Lizzie Anne Designs Anniversary page for today's blog candy locations. My turn for Blog Candy will be this Saturday (July 12th). Also, PLEASE upload your cards for the Birthday Sketch contest ~ you WILL want to win this prize! Supplies Used: Stamps ~ Hanna Stamps (Riley Collection) & Papertrey Ink (sentiment); Cardstock, pattern paper & ribbon ~ Papertrey Ink; Ink ~ Palette & Copics; Nestibilities. And here is another Riley creation from my weekend of mass producing. It was fun and very productive. I had a marathon stamping session yesterday (10 am to midnight ~ with some breaks to throw food at the kids ~ Oh I'm just kidding). But now I know that my weekend endeavor did in fact save me lots of time, because I didn't get as many cards done yesterday. OK to be fair, I was creating lots of individual pieces yesterday for lots of different holidays. I'll be posting all of those creations next week during the Lizzie Anne Sneak Peek. 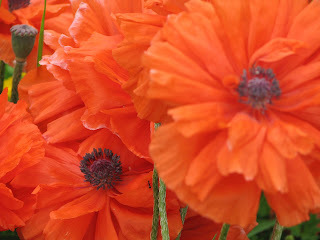 You should see my list of things to post ~ as it stands right now, I have cards to post until the end of the month! Supplies Used: Stamps ~ Hanna Stamps (Riley Collection) & Lizzie Anne Designs (sentiment); Cardstock, pattern paper & ribbon ~ Papertrey Ink; Ink ~ Palette & Copics; Punches ~ Marvy. 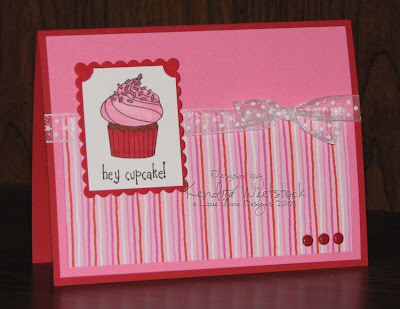 Don't forget to check out the Lizzie Anne Designs Anniversary page for today's blog candy locations. My turn for Blog Candy will be this Saturday (July 12th). Also, start uploading your cards for the Birthday Sketch contest ~ the prize is AMAZING!!! Every now and then I need to do things a bit differently with my card making ~ just to keep things interesting. I wish I could mass produce all the time just to get tons done, but I can't always work that way. It all started because last weekend I wasn't sure what I wanted to work on so I just started coloring a bunch of the new Riley images. I only colored the moose parts, not the rest of the image because I wasn't sure what paper I was using yet ~ this probably took about 20 minutes. The next day, I pulled out my Papertrey Ink pattern paper with all the matching cardstock and ribbons ~ YUMMY ~ they are just gorgeous. I started cutting cardstock bases and then added pattern paper and ribbon all without thinking too much about what I was doing ~ I would say this step took about 30 minutes or so. The last step was to figure out which images I wanted on each card and finish the coloring & mat them ~ this took about an hour. VOILA ~ I had 9 cards done. I do think it was probably a faster process (probably because I didn't agonize about every little thing I put on the card). My lesson ~ sometimes you just need to Let Go A Little! I realize they are not masterpieces, but that wasn't the intention of this experiment. Sometimes it's about making a work of art & sometimes it's about getting a lot done. Supplies Used: Stamps ~ Hanna Stamps (Riley Collection); Cardstock, Pattern Paper, Ribbon ~ Papertrey Ink; Ink ~ Palette & Copics; Embossing Folder ~ Cuttlebug; Ticket Corner punch ~ SU! 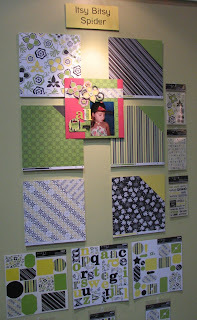 ETA: Don't forget to check out Lizzie Anne Designs for the blog candy schedule for this week. The design team members are all taking turns each day this week, so there will be lots of chances to win! A few months ago, a friend of mine asked if I would make a baby book as a shower gift for someone in her family. Since the mom & dad-to-be aren't going to find out if the baby is a boy or girl, we needed to come up with a suitable color palette and theme. 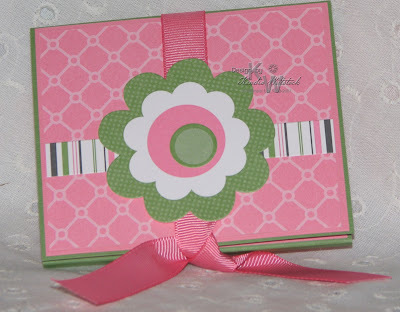 When I suggested these beautiful In Colors & a touch of Chocolate Chip from Stampin' Up!, my friend was thrilled. We also chose the Born to be Wild set from Lizzie Anne Designs, which is perfect for both a boy and girl. There are a total of 20 pages in this scrapbook, with the colors and animals repeated throughout. The only difference are the die cut words are new for each double page spread. These are 6"x6" pages so the perfect size pictures are 4"x3" ~ they fit perfectly & depending on the direction of the print, you may even fit 2 on a page. 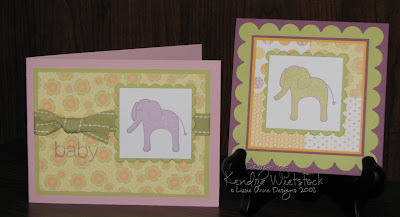 Supplies Used: Stamps ~ Lizzie Anne Designs (Born to be Wild); Textured Cardstock & Ink ~ Stampin' Up! (Wild Wasabi, So Saffron, Soft Sky, Groovy Guava, Chocolate Chip); White Cardstock ~ Papertrey Ink; Die Cut Letters ~ Cricut (Alphalicious); Nestabilities Dies by Spellbinders; Punches ~ Stampin' Up! ; Ribbon (on card) ~ May Arts.